This is the first of my Nutrition Matters postings for 2016. I had an incredibly hectic, but rewarding 2015, with visits to over 30 countries. I thoroughly enjoyed two weeks of hard working regeneration on my new farm in the Sunshine Coast Hinterland before returning to work at the NTS complex in early January. It was a very special start to a new year. Nutri-Tech Solutions was founded by my brother, Bryan, my ex-wife, Rosa and myself, 22 years ago. Their contribution to this company has been invaluable, but at the end of last year they decided to retire from the business and, as of January 1, I became sole owner of NTS. I have many plans for new innovations and improvements and I am hopeful that I can help many of you improve both profitability and sustainability in the coming years. I would like to wish all of my readers a happy, healthy, fulfilling 2016. These kinds of messages are, of course, all about you, and your intention to achieve these kinds of goals. The first month of 2016 is already behind us, but it is never too late to share wishes that might help galvanise our intent to make this a truly memorable year. In this context, I felt that it would be a nice way to commence Nutrition Matters for this year with a letter I received this week from Ben Randell, a South Australian farmer who recognised the potential for a biological renewal, courageously embraced a new approach, and is reaping the rewards. Ben's “happy, healthy, fulfilling future” was not an accident. He made a conscious decision to improve his farming operation. He educated himself in cutting-edge new strategies, made decisions about the validity of these concepts and then bravely plunged into a new approach. His innovations flew in the face of conventional wisdom. He suffered the condemnation of the local “experts” and emerged victorious. It is not easy to stand up for your beliefs. There is no profession more important than food production and these are the kind of heroes that should adorn the magazines, in the place of worthless celebrities. Thank you, Ben, for becoming a true leader in your region. My name is Ben Randell and I attended your courses at Penola, South Australia in 2014 and 2015. Our property is located in Meadows, in the Adelaide Hills. This year we followed a full NTS program designed by your South Australian distributor, John Norton. We run cattle and produce hay on our property. The success we experienced was nothing short of awesome. We sowed in some oats that grew to my shoulders and when I brix tested, just before seed set, they had the amazing brix of 22. They then dropped back to 16, when seed set started. We have only been here for three years, but have gotten to know a few locals. They think I am bonkers when I tell them things that I learned in your course. However, at the end of the season, it was a different story. These guys commented that my crops were by far the best that they had seen for the season. Some of the local hay contractors said the same, and they get over a lot of country. We had also agisted dairy heifers on the property. By the start of August, they had started to drop their winter coats. One month later, the cattle looked like race horses. Their coats were so glossy, you almost needed to wear sunglasses to look at them. They had also started putting on 2.4 kg a day. We turned them off at an average of 293 kg for 11-month-old cattle. Around here, this is up with beef cattle weights. These cattle also only ate what they could find in our NTS treated paddocks. In our permanent pasture, we doubled our brix level. It still has a way to go, but we went from 2-3 up to 5-6 brix readings. Our clovers boomed away this year. In previous years we have been hammered with red-legged earth mite. You could walk around this season and see only the odd edge of a leaf eaten here or there. The difference was especially obvious when you walked onto an area that we missed with your liquid fertiliser. In these areas, the clovers looked like spiderwebs! We also cut just 75% of the area we had harvested the year before, and yet we produced 350 more small square bales of hay from that area. I just wanted to say thanks for the information and passion you have shared in your course. This year we turned a lot of heads when growing such large, healthy crops. They told me, “You need to plant with ‘super’ and you need to feed the plant with more nitrogen”. They said, “You’re putting out way too much lime”, as we had put out some lime the year before. These guys have a lot of years of experience. Recently, I showed them photos of me standing in my oats crop. 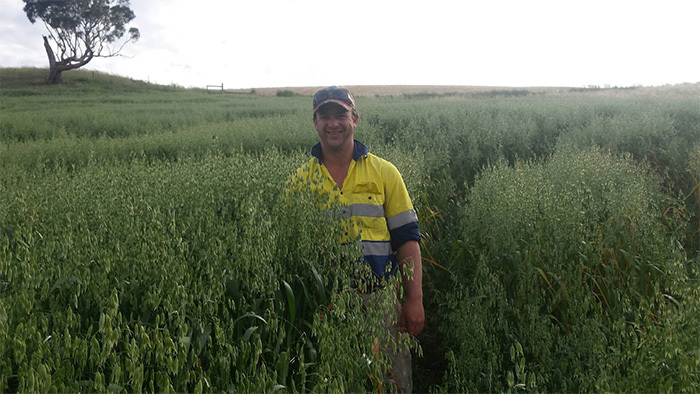 They said, "You must be kneeling in that crop, mate." These crops not only produced large amounts of hay, but they also had awesome brix readings. The cattle grew and grew and their health was exceptional. In fact, there were zero problems! I wasn’t sure how the program would fare at the start of the year, but decided to jump in boots and all. As the season progressed, it just got better and better. The amount of grass that grew was almost becoming a problem, as I found that it was a new challenge just trying to keep up with it. We are finally going in the right direction. The benefits I have seen in a single season are amazing and unexpected! Much healthier grasses, much bigger crops and thriving cattle. I can’t even really put into words just how thankful I am. I stumbled across a newspaper ad for your course and booked in, as it sounded interesting. Your teachings have changed the way I will farm in the future. The results this year are way outside what I thought was even close to possible. We grew much more high quality feed, the cattle went from strength to strength and the pest pressure was almost not worth looking for, because it was too hard to find. I have attached a couple of photos taken throughout the year as well. Please share my success and thanks with your team at NTS. A significant drop in brix levels during seed set is a classic sign of a shortage of potassium and/or phosphorus, at this critical time. If you were monitoring your crop with a Plant Sap Potassium Meter at this stage of the crop cycle, you would be amazed at the plunge in potassium in the leaf, as the crop plunders plant potassium to fill the seed. There is nothing more carbohydrate-dependent than filling seed. Potassium is used to move plant sugars into the regions where they are most needed. Phosphorus is the building block for the production of those sugars, via photosynthesis. At seed fill, you need the sugar factory pumping and you need optimum transport of these sugars. One productive trick at this time is to foliar spray MKP (monopotassium phosphate) to cost-effectively deliver these two minerals directly into the leaf. NTS Fulvic Acid Powder™ should be combined with the MKP to buffer, stabilise and magnify this acidic fertiliser. Nutrient density in pasture will always increase weight gain. 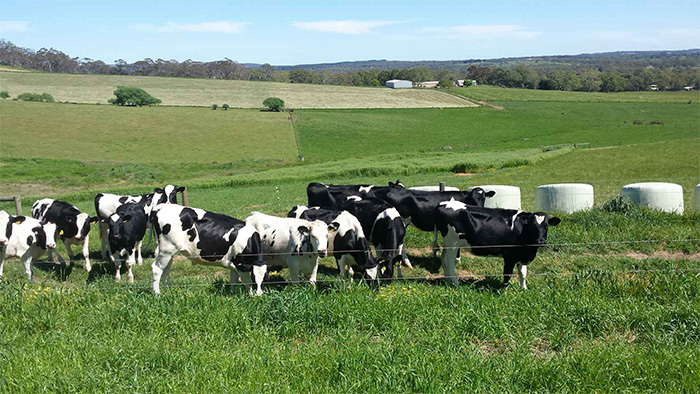 It should be a wake-up call for dairy, beef and other livestock producers to recognise that nutrition in the pasture will always dramatically outperform nutrition in the lick block. Plant-derived minerals are 98% bio-available, while those found in your mineral supplement feature less than 50% bio-availability. Do the sums on your farm and decide which option offers best value. Ben noted a marked reduction in pest pressure when he improved his nutrition. Plant immunity is driven by trace minerals that are neglected in many programs, particularly in pasture. When you address that broad spectrum nutrition, there can be big rewards. I hear many success stories as I travel the world sharing the Nutrition Farming® message. If you have experienced good results with NTS programs, I would love to hear from you. Please email me directly on graeme@nutri-tech.com.au.